Eurocom is adding MXM 3.0b based NVIDIA GeForce GTX 980M and 970M graphics to the Eurocom line of high performance, fully upgradeable laptops. “Our customers will surely welcome the incredible performance from the NVIDIA GeForce GTX 980M’s 1536 CUDA cores, running at 1038 MHz and 8 GB of GDDR5 memory running at 2500 MHz inside their fully upgradeable Eurocom notebook” Mark Bialic, Eurocom President. Having the ability to customize your Eurocom system allows users to have the perfect configuration for their needs and pay for only what they need. A variety of performance levels are offered in the line of graphics to allow customers to choose the precise performance level they need. With a combination of incredible performance and exclusive gaming technologies, NVIDIA GeForce GTX delivers a fast, fluid, lifelike experience. Next generation gaming includes support for Direct X 12. “Our customers will be very excited to have the option of upgrading their existing, fully upgradeable Eurocom notebook with NVIDA GeForce GTX 980M and 970M graphics or to configure it into their new system” Mark Bialic, Eurocom President. Eurocom customers can now combine NVIDIA GeForce GTX 980M in single and SLI with 32 GB DDR3-1600 memory, Intel Core i7 Extreme Processors and high capacity storage for unbeatable performance that is 50% faster than previous generation NVIDIA GeForce GTX 880M. Eurocom systems are custom built and fully upgradeable at time of purchase or well after, putting Eurocom customers in the driver’s seat of their high performance laptop. At Eurocom, the customer is king. 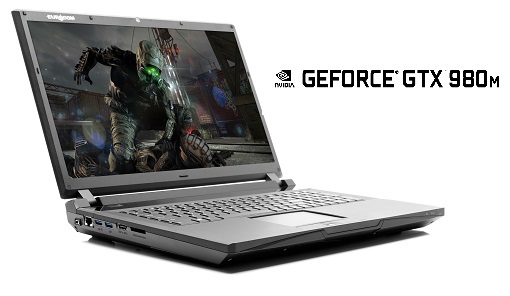 Experience true notebook graphics performance with next generation NVIDIA GeForce GTX 980M and 970M Maxwell graphics for advanced performance, unmatched power efficiency and cutting edge features. Now you can take on every game with unbeatable performance, raw power, and exclusive gaming technologies, plus the improved battery life you need to play longer, unplugged.